Hi babes and happy Tuesday! I took a poll a few weeks ago on the ‘Gram asking what kinds of pieces you girls were wanting to see here on the blog and one of the biggest requests was to see tops that could be worn for the office and date night! 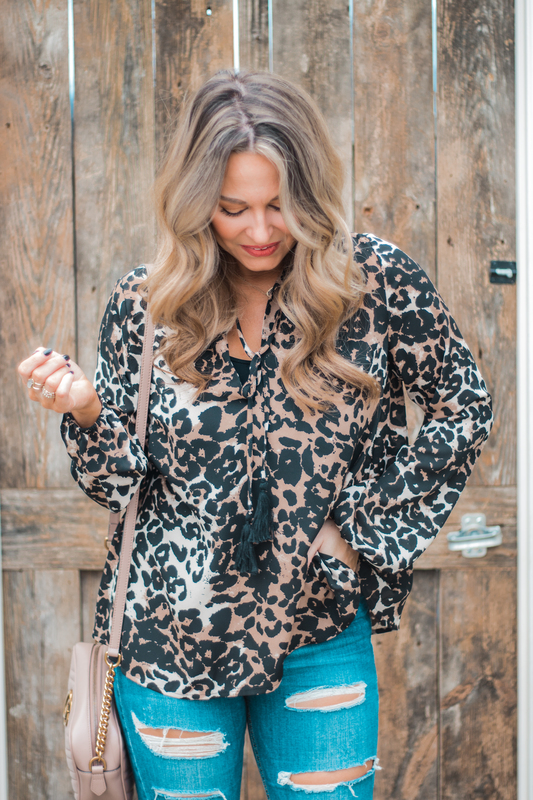 So when I spotted this gorgeous leopard blouse from Sugar Boutique, I knew it would be the perfect piece to share how one top can be worn two ways! I’ve been dying to wear these boots since I bought them in September, so for this shoot I decided to go the date night route with skinny jeans. 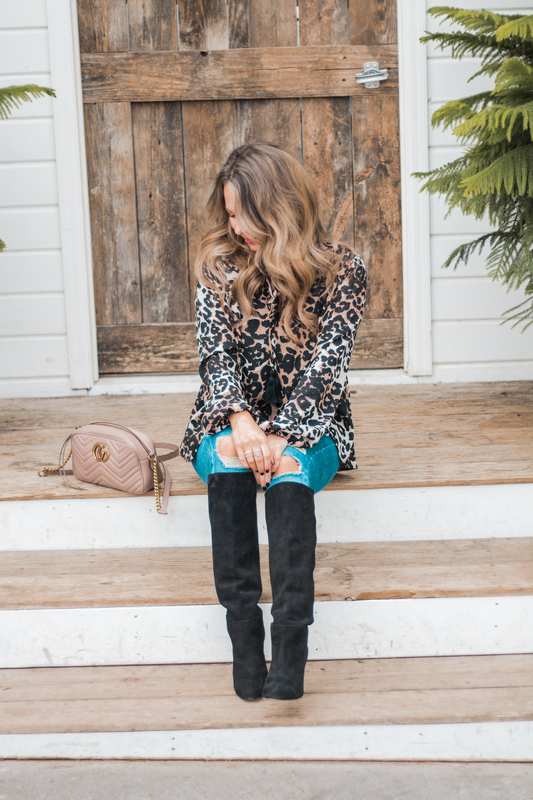 Nothing says Winter chic like jeans and a boot combo, and I love how the leopard print immediately elevated this otherwise basic look! 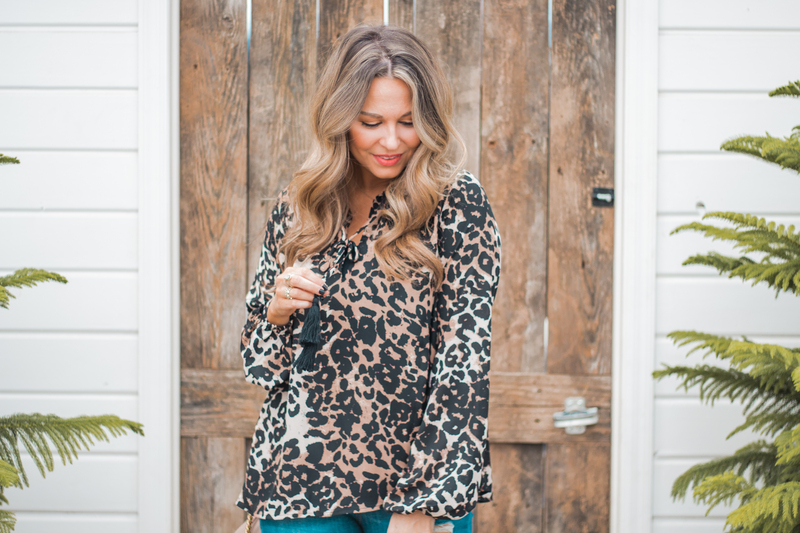 I’ve said time and time again that leopard print is the best neutral and this Buddy Love blouse does not dissapoint in the least! The cooler black + cream tones mixed with warmer brown + tan hues brings dimension to the print and the fun tassel tie detail makes it that much better than your average leopard blouse! If you are looking to style this for the office or for a more dressed-up occasion, simply swap out the denim and tall boots for a sleek pair of pixie pants or pencil skirt. These pants and this pencil skirt were both my absolute favorites when I worked in my nonprofit and city government positions! I’m a huge proponent of finding ways to flex your personal style, no matter what that may be, while still remaining office-appropriate, and for me, leopard print was just the ticket! And if you’re looking for holiday party inspiration, this top would look insanely fabulous with liquid leggings, black boots, and red accessories! Festive does not automatically have to mean the traditional red and green garb! 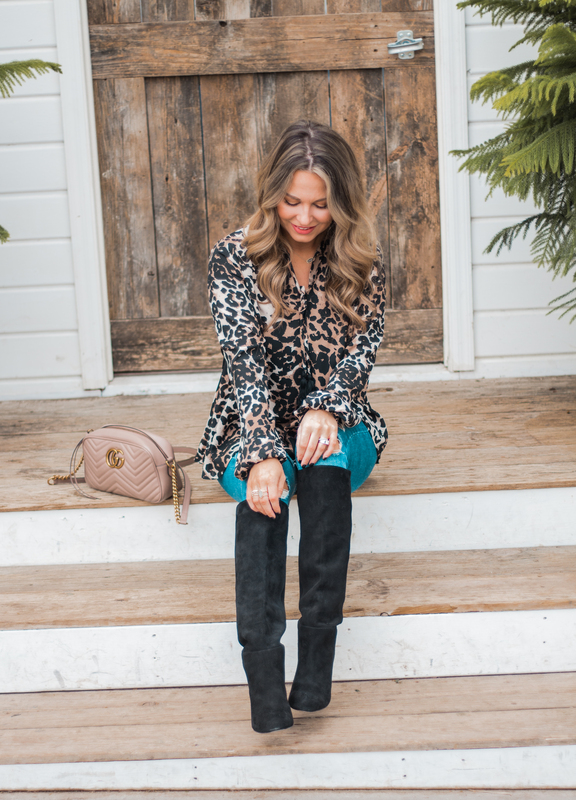 I always try to put my own spin on special occasions, and I think this leopard blouse would not only work wonderfully for all your holiday needs, but will also take you seamlessly from Winter to Spring! ← 30% off the Sabby Style Bracelet Set + THREE New Colors & a Necklace! Such a cute outfit! I love your hair, it looks so perfect! Thank you so much, Inna! Good hair days must be documented haha!